This design allows the operator to save and recall jobs in the future. This feature eliminates the expense for duplicating set-up time and adjustments. 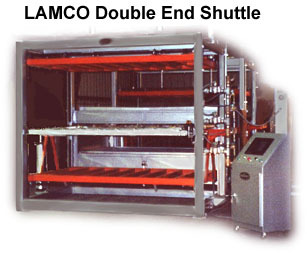 The Double End Shuttle allows for two simultaneous jobs to be run. All our equipment is designed to provide you high production, low maintenance operations. Our design and features equate to a higher profit margin with your product.